A Buddhist temple regularly hosts sermons and other speaking engagements. However, the venue size is inadequate to accommodate the large number of regular attendees (five to six hundred). Consequently, the temple staff required a live streaming multicast broadcast solution to make events accessible to all the viewers in their target audience, portions of which are distributed across a number of different locations. The temple staff required a product with an industrial level feature set and consumer level ease of use. It was necessary for the solution to provide both live streaming and recording for content management and re-broadcasting purposes. Since the temple lacks an onsite technical engineer, it was also necessary for the solution to be simple to install, operate, and maintain, without the need for specialized staff or training. Budget constraints were an additional consideration, with both the initial cost and total cost of ownership to be taken into account. AVerMedia assessed the case and made an appropriate recommendation. 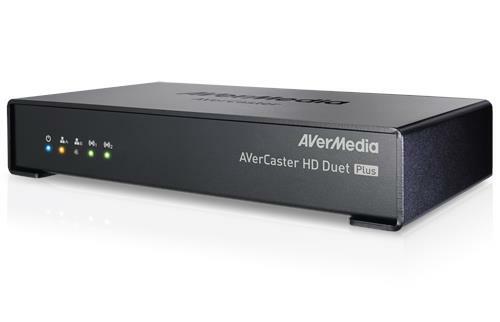 The solution required the AVerCaster HD Duet Plus F239+ (for live streaming, multi-casting, and recording), the VueSign BM110 CMS server (for content management), and AVerReceiver SR310 for decoding and displaying content selected by viewers, following the layout set by the CMS server. 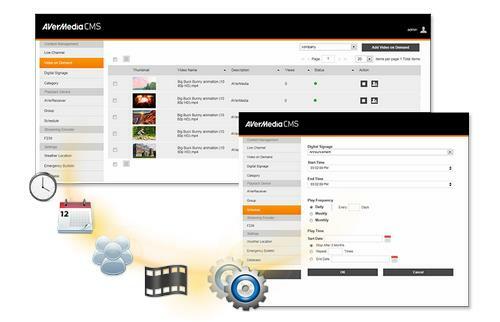 The VueSign BM110 CMS server stores and organizes media, and provides additional services such as digital rights management, customizable playlists, digital signage, and RSS feeds. The solution addressed the temple’s need to provide media to two different audiences; an internet audience and an intranet audience. In the internet scenario, live presentations recorded by cameras are sent to the F239+, which sends the media via an IP stream to the BM110 CMS server for recording and content management and to a Content Delivery Network (CDN) via RTMP for delivery of live video over the internet. 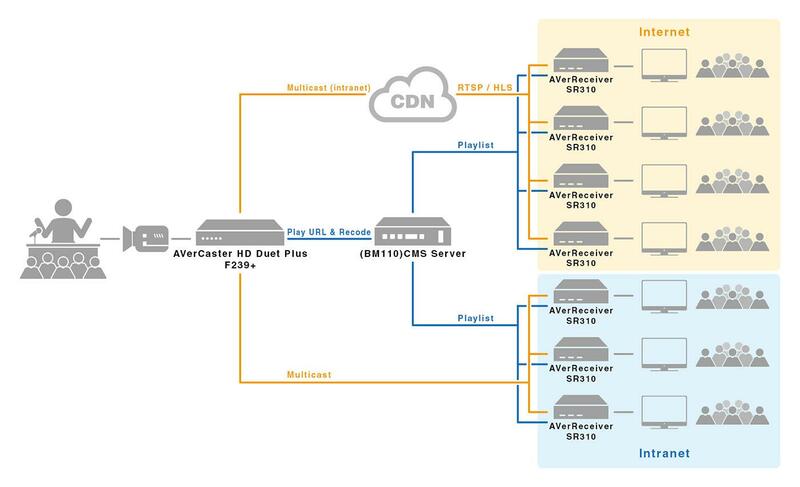 Members at all offsite locations use AVerReceiver SR310 to receive managed content provided by the BM110 CMS server via playlist data flow, and display the desired live stream from the CDN or pull VoD from BM110 CMS server. In the intranet scenario, live presentations recorded by cameras are sent to the F239+, which sends the media via an IP stream to the BM110 CMS server for recording and content management, and to each AVerReceiver SR310 for delivery of live video over the facility’s network (intranet). 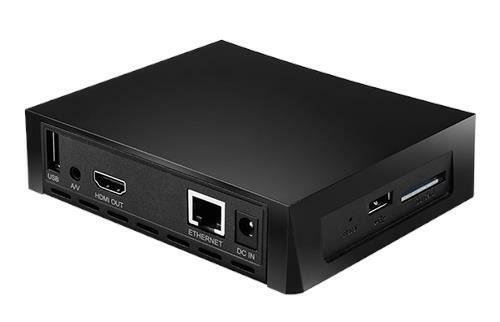 Onsite members use AVerReceiver SR310 to receive managed content provided by the BM110 CMS server via playlist data flow, and display the desired live stream from the AVerCaster HD Duet Plus F239+, or pull VoD from the BM110 CMS server. The AVerReciever is and compact plug and play solution simple to use and requires little maintenance.